Self-confessed foodie Huzefa Rangwala strongly believes that a doodle book, a cup of tea and a miniature Sagrada Família paperweight on his desk are accompanied by Danish architect Bjarke Ingels’ aura. 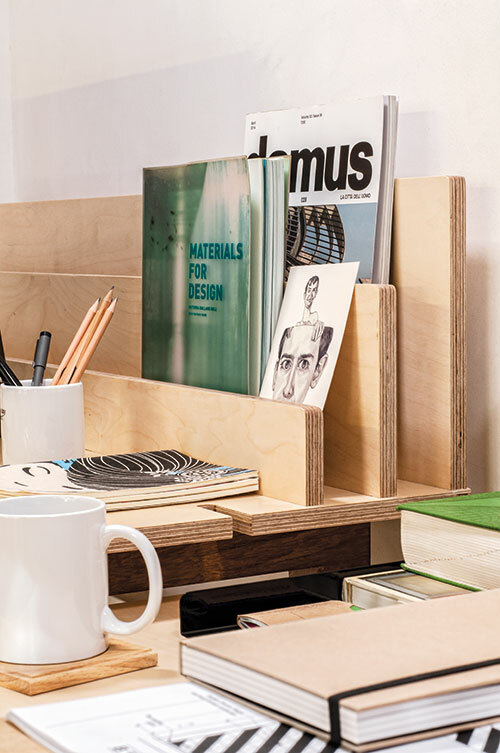 And his partner Jasem Pirani’s workspace comprises a book on materials, Foreign Office Architects’ Phylogenesis, a Globe notebook from Rubberband, plenty of knick-knacks and a “pretentious” cup of green tea. The duo established MuseLab in 2012 and are transforming spaces, one project at a time. HR: Both Jasem and I come from large corporate practices. With MuseLab, we made a conscious decision to steer away from the rigmaroles of designing under pressure. Most of our friends wonder how we get work done because each day is nothing short of a laugh riot! That said, a typical day is about solving problems, scheduling meetings, and discussing site visits or Netflix documentaries over lunch. JP: Some days involve three to four meetings outside the studio and on those days we yearn to get back to our drawing boards — our happy place. Huzefa Rangwala (HR): Diffused daylight, our materials library, hourly bouts of laughter, Sweetish House Mafia Nutella sea salt cookies and creative discourses. Jasem Pirani (JP): The various objects, or shall I say our inanimate pets, amusing stories and constant banter that keeps us entertained and of course our jali that filters and regulates the incoming light. What did you have in mind while designing the space? HR: Our focus was on identity and flexibility. We achieved an identity for MuseLab with the perforated laser-cut metal screen facade. All the furniture in the office is movable and can be easily disassembled, allowing us to relocate to another space with ease. Both: It has to be the mid-landing of the staircase leading to the loft. It’s the perfect corner for a cup of tea. 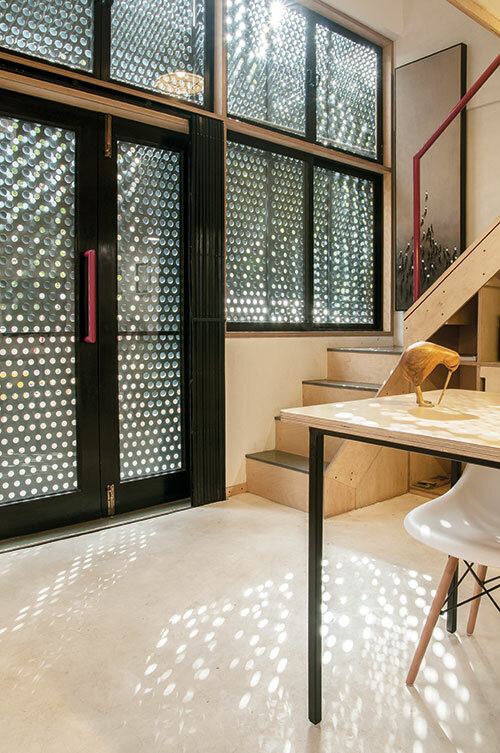 There is street art from Thailand on the wall that complements the birch plywood window frame, the polished Kota stone steps and the pink handrail; and all of these elements are sprinkled with the dynamic light bubbles formed by the metal screen. HR: I love concrete products — lights, cufflinks, paperweights or doorknobs. So it has to be my friends at Material Immaterial studio. And even though one doesn’t see Le Corbusier as an interior designer, I enjoy the simplicity of the spaces he created. JP: I admire the work of AvroKO for their integrated and process-driven design and their commitment to detailing. HR: We intend to remain a small practice with a focus on projects that are diverse and challenging. We also want to up the ante of our products label MuseMart with a new range of objects in the next few months. As for MuseLab, watch out for an all-organic and gluten-free cafe, an art nouveau boutique, a farmhouse in Punjab and some cool residential interiors that are all in progress.